The CRP-20 is a traditional cathedral top door with a raised, solid wood center panel. 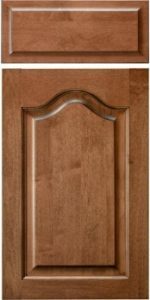 While cathedral doors are not as popular as they once were, this design is still a timeless option for any home and is ideal in a traditional environment. Consider using square doors on your base cabinets so as to keep the lines of the kitchen cleaner.